I love walking into a room that smells wonderful, fresh and clean! Nothing is quite as soothing as a house that smells good! Two of my favorite ways to make our house smell good are by baking and scented candles! As a mom who worries about everything, I love the fact that Candle Warmers don't require a flame like ordinary candles. I don't have to worry about the kids (or pets) knocking them over and starting a fire or getting burned by them. I also don't have to worry about forgetting to blow them out or turn them off when I leave the house, after all it's just a light bulb! I love the fact that each electric candle warmer comes in a couple different color choices to match any decor! You can also choose to purchase them alone or as a combo that includes a candle in your choice of scent. Candle Warmers make the perfect gift or addition to any room, home, or office! Among the Candle Warmers, Etc. product categories are: traditional plate candle warmers, candle warmer lamps and lanterns, the Jamie Clair line of wicked/wickless candles, candle warmer lamp accessories, and more. "Creating the ambiance of a burning candle releasing the candle’s fragrance within minutes." This giveaway will end October 31st at Midnight EST. Disclaimer: The Being Frugal and Making it Work family received a complimentary Candle Warmer and Scented Candle for the purpose of writing a review and hosting a giveaway. Regardless, I only recommend products or services I would use personally and/or believe will be a good fit for my readers. The views and opinions expressed on this blog are based purely by our own experiences. No monetary compensation was received. Results may vary. 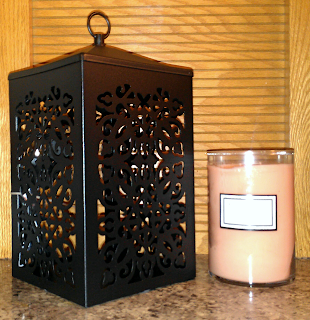 I like the Scroll Candle Warmer Lantern in Black with a vanilla candle scent. I like the Aurora Candle Warmer Lamp. I love the Toffee Damask Ceramic Candle Warmer & Dish. this would be perfect to use in my classroom. It would definitely cut down on undesirable smells. Yummy, she has too many different scents to pick from. However, I tend to like raspberry scent so I will go with raspberry cream. Tin Punched Candle Warmer Lantern is absolutely the cutest. It would really go with my antique decor. Just love it. Luckily enough, I like the Scroll lantern in black that you are giving away. I think it's my favorite! I like the Aurora Candle Warmer Lamp in Pewter. I like that it has a soft halogen light and that scent is released. I would like an Island Breeze scented candle because it will remind me of summer days in the Fall. I love the Illumination Fragrance Warmer. It is a very attractive piece as well as providing a great fragrance. I really love the Candle Warmer crock in Roman Red! It would be a wonderful gift for my mom, too. I actually really like the one you're giving away. I have a lantern that looks sort of similar, so it would match perfectly! My favorite would probably be raspberry cream. I love fresh raspberries, and this scent would remind me of them! I think it would look and smell great in my guest bathroom! I love the Scroll Candle Warmer Lantern - White! There are so many cute ones! My favorite is the owl plug in fragrance warmer! I love owls! Candle Warmer Crock is my favorite. Metallic Hurricane Candle Warmer Lantern! I love the Vintage Azure plug in candle warmer because I don't have much counter/shelving space and this would work perfectly! My favorite scent is the fresh linen because my boyfriend doesn't like it to strong plus it always smells like you just did laundry...who doesn't like that?! I love the Purex Crystals because the give your laundry that extra boost of smell good that I love! I love the Tin Punched Candle Warmer Lantern and I think Id also like the Raspberry Cream scent. Thanks for the chance. I like the Aurora Candle Warmer Lamp. The color and style of the lamp would look great in my living room. I like the Illumination Fragrance Warmer in Century Brown. 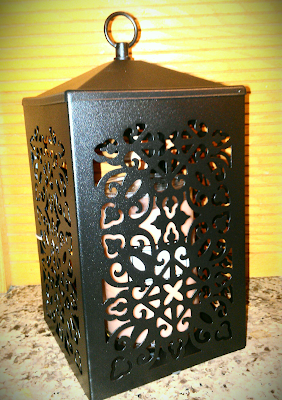 The Tin Punched Candle Warmer Lantern would look really pretty on our patio. My favorite candle scent is peppermint. I'm a huge fan of the Aurora Candle Warmer Lamp! The Pewter one is gorgeous! I need!! I love the old look of the Metallic Hurricane Candle Warmer Lantern and the Hurricane Candle Warmer Lantern.. gives your room a bit of charm. Mojito Lime would a favorite scent, I like a scent that is light and very pleasing. My favorite product is the Ceramic Candle Warmer & Dish in Tuscan brown. I like the look of it. My favorite scent is the sage and citrus. It sounds nice. I would like to try Candle Warmers Etc's Vanilla Strudle scent. Vanilla scented candles are my favorite. With Christmas coming up I like the Ceramic Candle Crock that is a Snowman. He is so cute! With Christmas just around the corner I would like the Balsum Fir scent since we have an artificial tree. I really miss the smell of a live tree. I like the style of the Aurora Candle Warmer Lamp. It would go perfectly with the vanilla candle (my favorite scent). My favorite is the Candle Warmer Lantern. All of the Candle Warmers are beautiful. However, my favorite is the Candle Warmer Lantern. I love the vintage look to it, yet very beautiful. I like scents that have that spicy yet clean smell. I think I would really like the Sage and Citrus fragrance candle. I think I would really like the mojito lime scent. Anything lime is a go in my book! I like the Hurricane Candle Warmer Lantern. It makes me think of something I would see in the movie Scrooge. Totally love this. I like the Aurora candle warmer. It is adorable and would look great in my living room. My favorite Jamie Clair candle scent is the Winter White scent that they have in wax melts. My favorite Candle Warmers product is the Scroll Candle Warmer Lantern, in the color White. The Jamie Clair candle scent that is my favorite is Primrose. I love the scent of Primrose. I like the Square Black Plug In Fragrance Warmer. I would want to use the Home for the Holidays Jamie Clair Wax Melts in it. Anything with Vanilla as a scent is my favorite. I have never had one that has been Vanilla Cinnamon. It would be very interesting to see what it smells like. I also like the Metallic Hurricane Candle Warmer Lantern. It's very unique, I love the brushed nickel finish!